Our adult student spotlight this week is Simeon Kuic. Simeon is a warm, friendly presence at our school. He brings the same attention to detail to his Tae Kwon Do practice that he uses as a chiropractic physician to treat patients. We admire that Simeon has kept up his practice even while going through major life events such as moving his business to a new space and having a baby! Go Simeon and thanks for being a part of our school. Why you practice: I joined after seeing several demonstrations at public events. Every time I was impressed with how happy and alive the group was…and the feeling as contagious! What you enjoy most about your practice so far: I love how Tae Kwon Do (and this group in particular) is so integrating. Sure it’s a physical work out…but it is so, so, so much more. Health is my profession, and I strive to teach my patients the importance of integrating the physical, mental, emotional, social (and spiritual) aspects of ourselves. It is the only way that true health happens. This place embodies that process. Other hobbies/interests: Music, hydroponic vegetable and herb gardening. 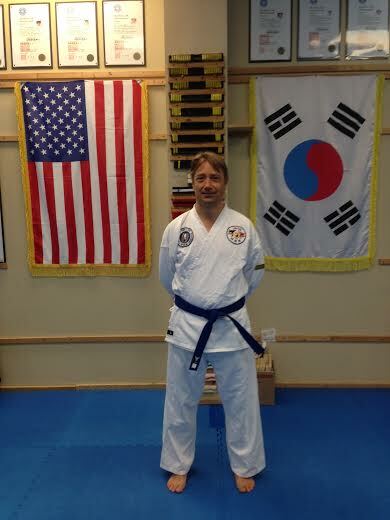 Favorite Tae Kwon Do moment: It happens about every testing. It’s usually when a kid is trying to break a board. They’ve made several attempts, their foot or hand is hurting, tears are welling in their eyes, they want to give up but hundreds of people are there watching. Then Master Morris calls them over. He looks them in the eyes and whispers something in their ear. Then they walk up to the board and break it and the crowd goes wild! That kind of energy is priceless. Our adult student spotlight this week is on Season Jacques. Season is a fun and hardworking mother of three. 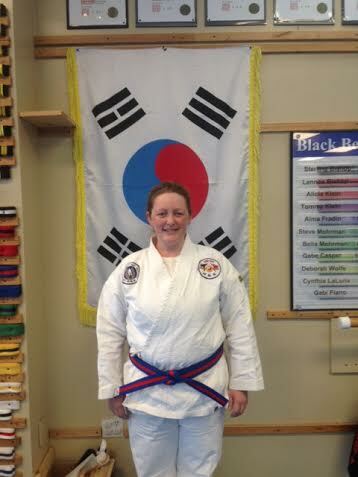 She practices Tae Kwon Do with her husband and her oldest daughter. We love having Season in classes here because she gets along with all types of people and makes new folks feel at home. Additionally, her personal practice is rigorous and her movements are powerful. Thank you to Season for being a friend and inspiration here at Sun Soo! What you enjoy most about your practice so far: The camaderie with my Sun Soo “family,” the positivity the DoJang encompasses, watching all of the practitioners go beyond their potential, how helpful everyone is. Oh, and losing 35 lbs in the first 6 months! Something people at Tae Kwon Do probably don’t know about you: When I was 15, my parents bought a school bus and converted it into a “house” where we lived for 9 months. Favorite Tae Kwon Do moment: My daughter doing her first board break with a flying sidekick, sparring with my husband, and never knowing when a crazy gorilla may attack! Our junior student spotlight this week is on Logan Carroll. Logan is a great role model for younger kids. He treats everyone with the utmost respect, practices diligently, and he is a great big brother to two little sisters. Logan always brings a smile and as a student he is flexible and reliable at the same time! We are proud to have Logan as a student here at Sun Soo! Why you practice: To build self control, to learn how to defend myself, and to do something fun. Something people at Tae Kwon Do probably don’t know about you: I’m extremely organized! 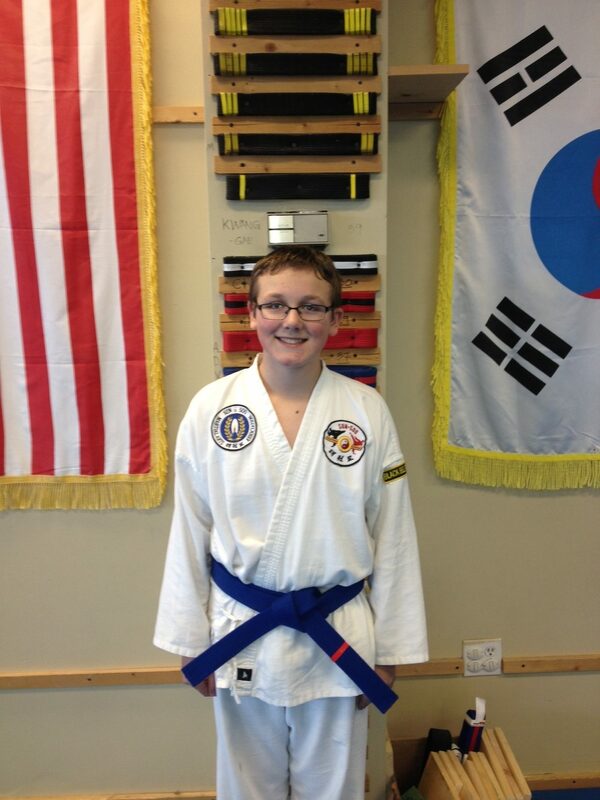 Editor’s note: Logan EARNED his white belt during his introductory session! There will be no classes held on the dates below. The school will still be open for meetings, lessons, and inquiries.